Short stay Convenient location. Local attraction very nearby. Great spot nearby water front. Staff very good. First class service. Right in the centre of the city. Excellent breakfast. Loved the location. Within easy walking distance of waterfront and Te Papa. Plenty of lovely cafes and restaurants close by. Clean, modern facilities. Friendly staff. Very clean, comfy bed. Pool was great, especially the spa. Location excellent. BUT hotel is in old building with no soundproofing so could hear neighbours talking, and lots of street noise. So take ear plugs. Excellent service from staff. Need a place to crash in Wellington? Whether you're planning on a loved-up escape with bae, a break with your mates or riding solo (cos why not! 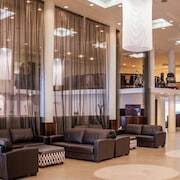 ), you'll find heaps of awesome hotels on lastminute.com.au. There's no need to stay anywhere else except in the heart of the action. There are 63 hotels within 2 kilometres of the centre just waiting for you to get your hands on. After checking out all the sights, kick back in bed with a movie at Ohtel or the Boulcott Suites. They're both a short walk away from the hustle and bustle. 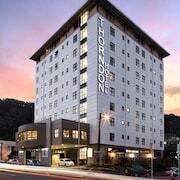 You could also try out the InterContinental Wellington and the QT Museum Wellington Apartments. Think about finding a place in the well-known neighbourhood of The best-rated area in Wellington. It has 52 available options and is located just 0.3 kilometres from the heart of town! The Bolton Hotel and At Home Wellington City have some nifty amenities. Want to see Mount Victoria Lookout? The CityLife Wellington and the Aspect Apartments are both extremely close. How about the Wellington Zoo? This incredible tourist sight is near the City Cottages and the Courtenay Village. 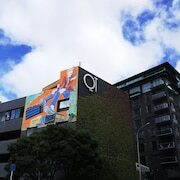 The QT Museum Wellington or the Amora Hotel Wellington are raring to go for those looking to stay nearer to Courtenay Place. 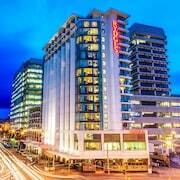 The Copthorne Hotel Wellington, Oriental Bay and the Rydges Wellington are no-brainers if the Te Papa is what you're waiting out for. Experience time standing still at St Barnabas' Church, a serene house of worship. 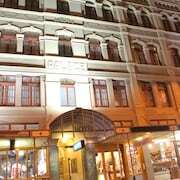 The Wellesley Boutique Hotel and Bella Vista Motel Wellington are a couple of good options if you and your mates are eager to stay in the area. If you're keen to get versed on the local history, Byrd Memorial is a worthwhile memorial to spend some time. Luckily, Distinction Wellington Century City Hotel and Quality Hotel Wellington are not too far away, so you can visit it as much as you'd like! After being cooped up in a plane for hours, there's nothing like a bubbling bath followed by a snooze in a soft cosy bed. So why not snap up a room at the Brentwood Hotel or the Beachfront Wellington Bed & Breakfast? 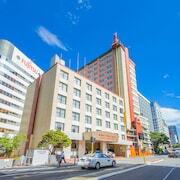 Each is within the vicinity of Wellington International Airport, which sits 6 kilometres from Wellington's centre.